The Stelvio Ti Sport model offers the best combination of looks, performance, and value at around $48,000. The 2019 Alfa Stelvio comes in base, Ti, and Quadrifoglio trim. For all intents and purposes, the Stelvio is a lifted Giulia sedan. It utilizes the same platform, suspension, brakes, steering system, and powertrains as the Giulia, and even shares many interior and trim components. Where the Stelvio wins out, however, is in cargo space and all-important ride height, making it the recently-revitalized brand’s best-selling model already. Thankfully, the similarity to the Giulia makes for a fun-to-drive experience, with fast steering and a tight, agile suspension. The standard 2.0-liter turbocharged 4-cylinder and 8-speed automatic transmission with paddle shifters hustle the base Stelvio and Ti along briskly, and with rear-wheel drive standard and all-wheel drive available, there’s a Stelvio for performance or all-weather optimization. For 2019, the Stelvio gets rear-wheel drive on the base model, Apple CarPlay and Android Auto as standard, and a new paint color, heated rear seats, and a premium alarm system as options. The Stelvio and upgraded Ti model also get a new “Nero Edizione” package that includes blacked-out exterior and interior trim including unique 20-inch wheels. Finally, the Stelvio Ti Sport gets a new Carbon package that includes carbon-fiber trim pieces all over the exterior. The 2019 Stelvio is also available in rip-roaring Quadrifoglio spec, complete with a 505-horsepower Ferrari-sourced V-6 and a 0-60 mph time of 3.6 seconds. The 2019 Quadrifoglio is also available in the Nero Edizione, and now comes with anodized brake calipers and 20-inch forged aluminum wheels. Priced and positioned as a true luxury SUV, the Stelvio comes with many premium features as standard and options, though other than a rearview camera, buyers will have to shell out for one of two driver assistance packages to get active safety features like automatic emergency braking. Available in base, Ti, and Quadrifoglio spec, the Stelvio comes with many option packages, including Sport and Lusso depending on the trim level selected. With hardly a straight line in sight, the 2019 Alfa Romeo Stelvio reminds us that SUVs don’t have to be blocky. Like the Giulia sedan with which it shares a platform, the Stelvio wears angular headlights, the iconic “trilobo” grille, and curves in all the right places, making for one of the best-looking SUVs on the road. A conventional two-box design with a sloping roof and tapered rear end give the Stelvio a sport wagon-like look rather than a crossover, and the fender flares and muscular hood all point to the underlying performance chops. Available 19- and 20-inch wheels on the Sport package increase the drama, while the Quadrifoglio model turns the sporty styling up to 11 to go with its 505-horsepower. Inside, Alfa keeps things fairly simple, and while some plastics are cheaper than competitors, from a looks standpoint, the Stelvio is on par with its rivals. A standard flat-bottomed steering wheel and paddle shifters serve as a centerpiece, and the keyless ignition switch is mounted right on it. The infotainment screen is nestled into the dashboard design unlike many tablet-like offerings from other luxury SUVs, and the seats come in a number of hues including red, which adds a lot of flair to the cabin. Real wood and aluminum adorn the dash on certain trims, and other plastic pieces and design flourishes are kept to a minimum. 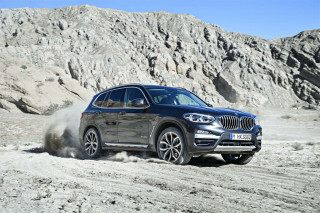 This SUV is all about driving, after all. The 2019 Alfa Romeo Stelvio delivers on all the promises its brand makes with excellent engine and handling performance. 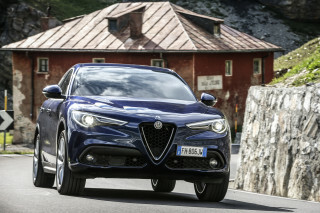 Like the Giulia, the Stelvio is available with two engines and drivetrains. 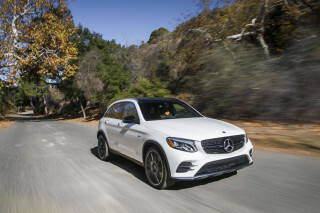 A 2.0-liter turbocharged 4-cylinder powers the base and Ti models, making 280 horsepower and 306 pound-feet of torque through an 8-speed automatic transmission with paddle shifters. 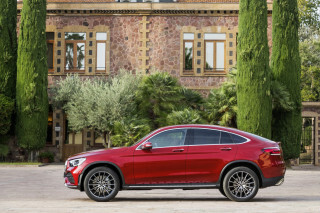 That’s enough grunt to hold its own against competitors across the luxury spectrum, and with rear-wheel drive now available on the base model (all-wheel drive is standard elsewhere), this is a true performance-oriented SUV. A 0-60 mph time of 5.4 seconds is among the best in its class, and a 144-mph top speed is right in the thick of the competitive set. Just as with the Giulia, the Stelvio comes with Alfa’s DNA drive mode selector; D for Dynamic, N for Natural, and A for All-Weather. Dynamic mode turns up the intensity in the gearbox and throttle, while All-Weather helps modulate traction between all for wheels on all-wheel-drive models. Where the Stelvio really shines, however, is on a twisty back road, as the suspension, steering, and handling are all good enough to give some sport sedans a run for their money. Thanks to a perfect 50/50 weight distribution and a relatively short wheelbase, the Stelvio carves corners with the best of them, and gets even better in Sport form or with the Ti Performance Package. The brakes are the only area of complaint, with an all-electric assist system that doesn’t provide the sharpness or response that other areas of the Stelvio’s experience do. While the base Stelvio is a pleasure to drive on its own, true performance junkies will want the insane Quadrifoglio model, which uses the same 505-hp twin-turbo V-6 found in the Giulia model with the same four-leaf clover designation. 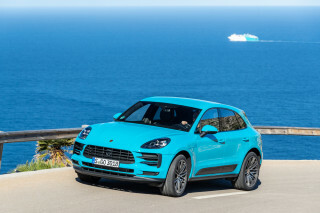 With a 0-60 mph time of just 3.6 seconds, this SUV is the fastest ever around Germany’s famous Nürburgring and comes with all sorts of race-ready performance gear including available carbon-ceramic brakes, sports exhaust, fat tires on massive wheels, and improved engine cooling and intake components. A tiny rear seat and some questionable plastics make it difficult for the 2019 Alfa Romeo Stelvio to win in the quality department. The Stelvio comes in three main trims, base, Ti and Quadrifoglio, while a Sport package is available on the base and Ti models and Lusso on the Ti. Sport models get heavily-bolstered seats and racy wheels among other options, while the Lusso model has finer leather and classier touches. Bigger drivers should try on the smaller seats before they judge them a good fit. While real wood and metal trim is available–not to mention carbon-fiber on the Quadrifoglio–material quality is not the Stelvio’s strong suit. Some plastics are thin and ill-fitting upon closer inspection, including the dial interface used to control the infotainment system. Additionally, rear legroom is fine for children, but adults will find it a tight squeeze at just 31.9 inches, 4.5 inches less than the next closest competitor, the BMW X3. Cargo space suffers from a sloping roofline as well, though it still offers 18.5 cubic feet behind the second row and 56.5 cubic feet with it folded flat. The 2019 Alfa Romeo Stelvio has not been crash-tested and includes no standard active safety features. All Stelvios come with rear parking sensors as standard, but that’s where the non-mandatory safety features end, as all active options are available in one of two packages. The $650 Driver Assistance Static package adds only blind-spot monitors, while the $1,500 Driver Assistance Dynamic Plus package includes automatic emergency braking with forward collision-warnings, adaptive cruise control, lane-departure warnings, and blind-spot monitors. 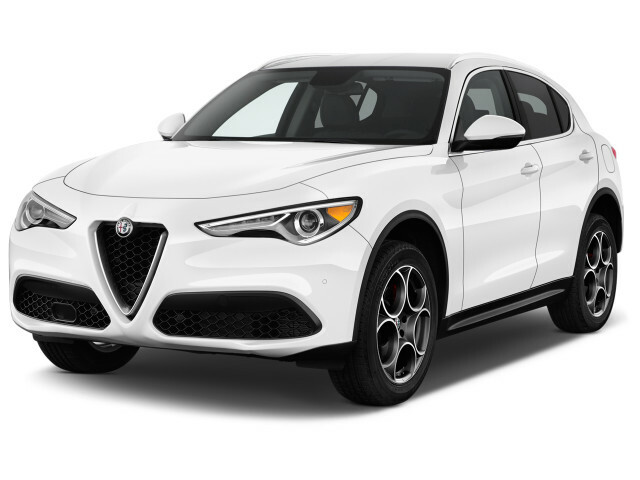 Solid standard features and lots of luxury options keep the 2019 Alfa Romeo Stelvio competitive in its class. As standard, the 2019 Alfa Romeo Stelvio comes with power features, 18-inch wheels, LED taillights, dual-zone climate control, leather upholstery, a 7.0-inch instrument cluster display, and a 6.5-inch infotainment system with Apple CarPlay and Android Auto as of this year. It doesn’t have automatic emergency braking, an essential for a vehicle in its price class. 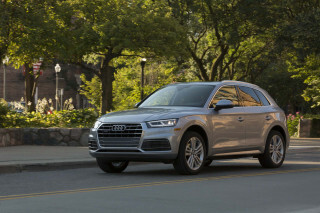 Opting for the Ti trim includes wood trim, heated leather seats, an upgraded 8.8-inch infotainment system, satellite radio, 19-inch wheels, and front parking sensors, while the $1,800 Sport package adds 19-inch wheels, sport-tuned suspension, and paddle shifters to the base model or the Ti. A Lusso package is available on the Ti model, which includes upgraded leather seats and some other luxury-oriented trim pieces. For 2019, the Stelvio gets heated rear seats, a new alarm system, and Imola Titanium Metallic paint, while two new packages add some visual flair. The Nero Edizione adds blacked-out wheels and trim pieces to any Stelvio model, while the Sport Carbon package adds carbon-fiber trim to Sport models, and the Carbon Fiber package adds similar trim to the Quadrifoglio model. For those interested in increased performance, the Performance Package adds active suspension, a mechanical limited-slip differential, and paddle shifters to those models that don’t already have them. The Quadrifoglio model is packed with performance-oriented features, including heavily bolstered seats, Alcantara trim, carbon-fiber accents as an option, and carbon-ceramic brakes that add a whole lot to the price but pack a punch in terms of stopping power. Thankfully, the Stelvio is available with a 4-year, 50,000-mile warranty for the entire vehicle, while the powertrain is covered for 5 years or 100,000 miles with the first engine service included for free. That’s better than most mainstream cars but lags behind other luxury offerings, a shame considering Alfa’s less-than-stellar reliability record. With an average of 28-mpg on the highway, the 2019 Alfa Romeo Stelvio is right in the heart of its competitive set. The base, rear-wheel-drive Stelvio manages 22 mpg in the city, 29 on the highway, and 25 combined, while all-wheel-drive models throughout the rest of the range manage 22/28/24 mpg. We base our rating on those AWD versions. Naturally, the high-performance Quadrifoglio model is thirstier, managing 17/23/19 mpg from its twin-turbocharged V-6. All versions of the Stelvio require premium gasoline, so be prepared to pay a bit more at the pump.